Dodatak ishrani naročito potrebani onima koji se izlažu naporima kao što su sportisti. Ojačava organizam, podiže imunitet, nadoknadjuje sve potrebne elemente iz ishrane koji se redje unose. Sadrži četiri ekstrakte četiri biljke- Sibirski ginseng, guaranu, Spirulina alge, Kola-orah. Takodje sadrži vitamine A, E, C, B kompleks, hrom, kalcijum, magnezijum, fosfor, kalijum, gvoždje, jod, mangan, bakar, cink i molibden. Stimulation and energy, increased capacity for work. In each of us, strange things sometimes happen... Suddenly, in spite of good health and a lack of physical shortcomings, we start feeling broken down and exhausted. The very thought of our favorite activities repulses us and life and the world around us loses its color. The company of those closest to us begins to irritate us, our favorite foods seem unseasoned and flavorless, the innocent jokes of friends hurt our feelings or just unhinge us completely. As a result we either fall into depression or become aggressive. Neither of these options bring relief nor do they cure us. Frequent and long- lasting stress makes us vulnerable to states like this, and it's not just a matter of having bad moods - that wouldn't be so terrible. What is worse is the fact that stress affects the immune system in the body. If we don't take care of ourselves in moments like this, the next phase might be the development of frequent colds, then the true picture of chronic tiredness, first described in Tahoe (USA) in 1984. This illness has recently taken on the proportions of an epidemic. Unfortunately, we don't have statistics in our country as to the prevalence of this illness, but in the USA, according to statistical data, over 5 million people suffer from it. The surest way of avoiding the syndrome of chronic tiredness is to reduce one's vulnerability to stress and to create a positive perception of reality.CHROMEVITAL+ contains everything you need to reach that goal. It contains Siberian ginseng (one of a group of plants that fulfill an adaptogenic role), Guarana, and Kola nut, containing a full spectrum of active substances, among them caffeine. 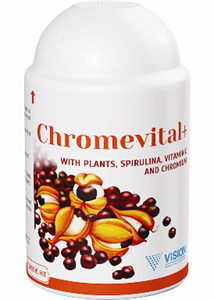 The fourth plant ingredient in CHROMEVITAL+ is Spirulina, a seaweed regarded all over the world as one of the most promising sour­ces of protein (over 60% of its biomass is protein). A mysterious "growth control factor" has been isolated in Spirulina, a factor that remains unidentified, that controls growth and development in cells. This plant contains this substan­ce, which demonstrates anti-cancerous effects. CHROMEVITAL+ also contains vitamins A and E and the entire B vitamin group, mineral substances, calcium, magnesium, phosphorous, potassium, iron, iodine, manganese, copper, zinc and molybdenom Using CHROMEVITAL+ allows you to experience all of the unique properties of the plant ingredients it contains for yourself. This biologically active supplement compensates for deficiencies of vitamins, minerals and other biologically active dietary components; recommended for overall strengthening, helps concentration and the overall resistance of the body.